Do you remember the launch of Windows 95? Then we've got bad news: you're old! Windows 95 turns 20 this week, and it's amazing how far we've come: just look at tech in the newly-leaked Lumia 950, the Sony-teased Xperia Z5 or the imminent iPhone 6S compared to the PCs we had back in the day. Isn't tech great? It is, and this week we've got a particularly fascinating selection of tech leaks, tweets, master plans and mysteries just for you. 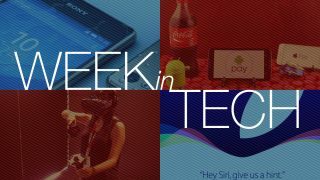 It's week in tech! Is Sony teasing us with details of the Xperia Z5? It certainly looks that way: its official Xperia Twitter account asked everyone to "get ready for a smartphone with greater focus" which it'll reveal on the 2nd of September. techradar's Matt Hanson put on his special detective hat and investigated. His conclusion? "It looks like Sony is preparing to show the Xperia Z5 with an improved camera at IFA 2015 in Berlin." Matt asked Sony to comment: "Nothing else to say," they responded, "but keep an eye out..."
This week we got an invite in our inbox confirming that Apple's big iPhone event will take place on September 9. The invitation included the caption "Hey Siri, give us a hint" (Spoiler: she won't) however we're expecting to see the iPhone 6S and 6S Plus, and quite possibly a big update to Apple TV. What's better on the inside than it is on the outside? Yes, a deep-fried Mars Bar - but also the Microsoft Lumia 950, which has been leaked well in advance of its October launch. It may look decidedly mid-range, but inside there's a beating octa-core heart, 3GB of RAM and a 20MP PureView camera. Wireless charging, USB-C and an Iris scanner are apparently in there too. Google has just chucked a frag grenade at game streaming service Twitch with the launch of YouTube Gaming, which is - yes! - YouTube for gaming. It does what Twitch can't, says Kevin Lee: it can "stream at 60 frames per second through HTML 5" and "has the DVR functionality built into it, which allows fans to easily pause, rewind and speed up the stream — all features not yet available on Twitch." It's on the web, iOS and Android for US and UK users. It's Movie Week here at techradar, and that means stacks of fascinating stuff about movies and movie tech. Want to know what sci-fi movie tech actually exists, how the Batmobile has evolved or how green screen works? We've got all that and more. If you like things that are good, you'll like our Movie Week stories. Yep, that's the Rolling Stones' Start Me Up, the launch anthem that had us literally queuing at midnight to get… Windows. But Windows 95 was a very big deal indeed, not least because it was the first stand-alone Windows that didn't sit on top of DOS. It also came with something called the internet, which turned out to be kinda important. 20 years on, Gary Marshall recalls that it was "like a visitor from the planet Groovy" and argues that Windows 95 was "the OS that changed it all." Google says: you're gonna pay! Don't worry, it's not a threat. It's a promise. Android Pay could be arriving more imminently than something that's about to happen really soon. Multiple rumours said it would happen this week, and while it hasn't gone live as we write this, Google is teasing everybody on Twitter about it - possibly to calm speculation if it hasn't launched by the weekend. Is it worth waiting for? techradar's Matt Swider says it is. Here are three ways Android Pay is better than Apple Pay. It feels like Valve's hardware rollout has been a case of delay followed by delay. This week the company announced that the headset will only be available in limited quantities at the end of this year, with a full-scale rollout planned for early 2016. So unless you're a developer or really lucky, you probably won't be spending another Christmas day listening to grandmas's stories about "the good old days" rather than in a far-off virtual land. We've said on many occasions that Facebook rarely meets a good idea it doesn't want to copy, and this week the good idea is the voice-activated digital assistant. Facebook's M is a rival to the likes of Siri, Cortana, Google Now and Amazon's Alexa, but it has a unique selling point: it involves humans as well as tech. For now M is in test mode, but it's definitely one to watch.